SEVEN organisations have joined a scheme to encourage staff to travel during off-peak hours, in a bid to reduce congestion and not overstrain the transport system. The scheme called Travel Smart comes from an inter-ministerial work group and the Land Transport Authority (LTA), whose staff, and those from six other organisations - numbering about 10,000 in all - will be involved. The aim is to have 13 organisations in the two-year pilot. LTA's group director for corporate planning and research, Mr Lew Yii Der, said while building up Singapore's transport infrastructure is the focus at the moment, projects will take time to complete. In the interim, travel demand management will help improve peak-hour commutes, he added. 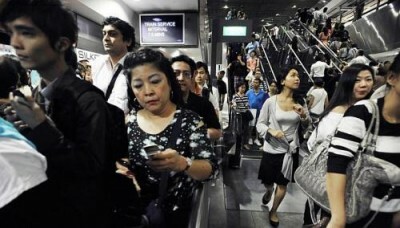 The LTA said the "peak-of-peak" period is between 7.45am and 8.45am. Data has shown that there are two to three times more commuters during that hour, compared with the half-hour period before it. There are also 20 per cent to 40 per cent more commuters during the peak-of-peak period compared with the half-hour period after it. With the help of United States-based consultant Aecom, participants in the pilot will be given customised plans to motivate staff to change their travel habits. These could include offering incentives to employees to turn up for work earlier, having flexible work arrangements and staggering the times they have to report for work. Organisations will also be asked to consider providing more bicycle racks and shower facilities and giving priority parking to drivers who car pool. Aecom has successfully helped cities such as Manchester and Sydney implement similar schemes. The Educational Testing Service in Princeton in the US, for example, managed to increase its car pool rate by 9 per cent. Minister of State for Transport Josephine Teo, who was at the launch of the scheme yesterday at the LTA, said: "Even a shift of 10 to 15 per cent out of the peak-of-peak will make the commuting experience more pleasant." Currently, two schemes to promote off-peak travel have made some impact. The Incentives for Singapore's Commuters study uses prizes and cash rewards to get participants to alter their travel habits. Six months after it was launched, about 10 per cent of the 17,000 participants have switched to off-peak commuting. Train operator SMRT also offered a fare discount of 30 cents for early-bird travellers heading to nine stations in the morning. This resulted in a shift of from 3 per cent to 4 per cent, or 2,000 of about 60,000 commuter trips. The discount was recently increased to 50 cents, and is now applicable at more stations. Spring Singapore, one of the seven organisations that have signed up for Travel Smart, said it values work-life balance. Its director of human resources and organisation development, Ms Christophane Foo, said about one-third of its 400 staff are involved in account management. "These employees are usually moving around and don't have their own desks, so flexible work hours are ideal for them," she said.